Dennis, the owner of DTW Netcom LLC, reached out to us several weeks ago about our website design services. He was getting quotes from different designers to update his existing website. The website he had was a Flash-based website which doesn’t work on the majority of devices – including computers. Computers now require that you whitelist Flash websites if using Chrome, specifically enable the Flash-based content in Firefox, and doesn’t work in Microsoft Edge. The only browser that allows Flash to play automatically is Internet Explorer. We provided Dennis some options on whether he wanted us to host the website or continue to keep the hosting with his current provider and outlined the cost differences. Dennis had just renewed his hosting in April with his current provider for a year – otherwise he would have had us host the site as well. Dennis let us know last week he was ready to start on the site. We worked that same evening to get the general setup done. The next morning, Dennis sent us the text information he wanted to have on the site. Some minor changes were done and the website was just published to his hosting account today! 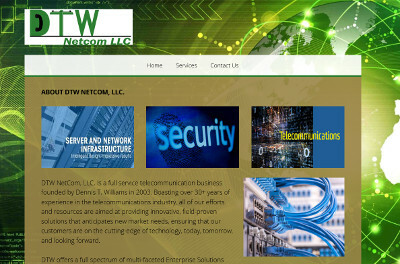 The website for DTW Netcom LLC is at dtwnetcom.net. Darryl, the owner of Cunningham Power Washing, emailed us several weeks ago about our web design service. Darryl had a specific budget in mind for the site and we were able to meet the site and actually exceed it. When we initially started, he sent us the Word document of everything he wanted on the site and followed up with his logo. After the work was done, we had two fewer pages than he initially thought so that saved him cost and allowed him to get another feature and still stay under his budget. In the end, Darryl has a five page website with a homepage slideshow, a basic contact form, social networking integration, hover over menu navigation, mobile compatibility, and a picture gallery. The website is at cunninghampowerwashing.com. Chris reached out to us a few weeks ago asking about our website design services. Initially, he preferred to work with someone local to his area in Boise, ID. However, after speaking with us over the phone and seeing how well we work with our customers and our response rate, he decided to go ahead and have us assist with creating the website. Chris provided us a shared folder with the information and pictures he wanted on the website. After about a week, the website was completed and approved! The website includes several features including a few extra web pages, a homepage slideshow, a basic contact form, and mobile device compatibility. Crossfire Rollins website is at crossfirefastpitch.org. Corbett, the owner of Corbett’s Burgers, contacted us last week asking if we provide website update services. Our answer – absolutely! He had a website person make the site but was no longer able to get in touch with him to get changes done to the site. So, he reached out to us asking for help. He had an updated menu and needed to have this added to the website along with a few changes to the text on the website. He also wanted to have a direct link to an order delivery service for customers. Once we received the updates Corbett needed, we had them completed within 24 hours. We appreciate the business from Corbett’s Burgers! Website Design for Serenity ResCare Reserve, Inc.
Yolanda, the director of Serenity ResCare Reserve, Inc. in Gainesville FL reached out to us in need of a simple website design. She already had the domain name and an email address established – but needed help with website hosting and also the design itself. Initially she wanted to go with a simple site with just a few features such as basic PayPal integration to accept donations and a basic contact form for inquiries. The information and photos were sent over quickly and we had the site mostly completed within a few days. Everything is now completed and the website is published! Thank you Yolanda for trusting BsnTech Networks for your website design and website hosting needs. The website is at serenityrescare.org. BsnTech Networks received a request from a person that wants to remain anonymous. 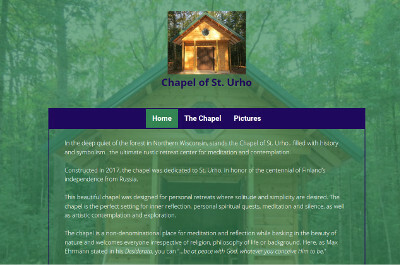 The individual requested to have a website created for a chapel that was constructed in Brantwood, WI – the Chapel of St. Urho. The website is a very simple site that showcases a few pictures of the chapel along with location information. The address is at chapelofsturho.com. Maggie and Cody contacted us a few weeks ago asking about website and logo design services. Maggie provides a fishing guide service in Montana and wanted to get a professional logo created along with a website. Our logo designer worked with Maggie and after several renditions of the logo, they have approved of the design and it is completed! We will have their website done very shortly as well.